In 2015, NoLi CDC, in partnership with 7 other environmental and community organizations, was awarded an $80,588.50 grant from the Lexington-Fayette County Urban Government to implement a water quality program funded through the Stormwater Quality Projects Incentive Grant Program. Utilizing the skills of these North Limestone-based environmental and community organizations, the FY15 Water Quality Program will resolve storm water issues in the North Limestone and Castlewood Neighborhoods. Each part of the proposal is managed by a different neighborhood-based environmental organization, with the entire project being administered and coordinated by the North Limestone Community Development Corporation, in partnership with the North Limestone and Castlewood Neighborhood Associations. THE TOTAL RAINWATER SAVINGS FOR THE FY15 WATER QUALITY PROGRAM WILL BE APPROXIMATELY 1,220,040 GALLONS ANNUALLY. THIS WORKS OUT TO A COST OF $0.08 PER GALLON, WHICH IS A LOWER COST PER GALLON THAN ANY STORMWATER IMPROVEMENT PROJECT DESCRIBED IN THE 2012 LFUCG-FUNDED SUSTAINABILITY PLAN. This aspect of the plan will see the design and construction of two rain gardens in Castlewood Park that will address stormwater runoff from the park. This area was identified as an essential stormwater project in the LFUCG funded stormwater feasibility study in 2012. The primary function of the rain gardens will be to use soils and native Kentucky plants to slow stormwater runoff, and remove contaminants that are carried by stormwater runoff through natural processes. These soils mimic natural drainage processes, and lessen the volume of stormwater during rain events. By installing a rain garden, we improve both physical and biological integrity by preventing additional erosion and chemical leaching, and reducing the load on the city’s stormwater infrastructure. A secondary function of the rain gardens will be to develop a unique facility to support community education, awareness and engagement for stormwater related efforts. ACCORDING TO ESTIMATES, WE EXPECT THIS RAIN GARDEN TO CAPTURE AND SAVE 111,300 GALLONS OF STORMWATER ANNUALLY. According to a survey done by the University of Kentucky’s Landscape Architecture Department in 2014, around 30 percent of linear roadway in the North Limestone Neighborhood is not covered by a canopy of trees. This aspect of the plan would fill in the majority of that gap by planting street trees on Glenn Place, Arceme, Carlisle, Withers, Rosemary, Bryan from Morgan to Meadow Park, Beltline, North Limestone from 7th to Loudon, and Loudon Ave. Through this initiative, we will plant 120 street trees in the North Limestone Neighborhood, and educate neighbors on the incredible values of planting street trees. Trees are enormously beneficial to storm water remediation. Trees draw large amounts of water from the soil; this water is eventually released into the atmosphere as vapor from the canopy. Trees also absorb water through their leaves, branches, and trunk, delaying the onset and reducing the volume of rainwater that hits the ground. 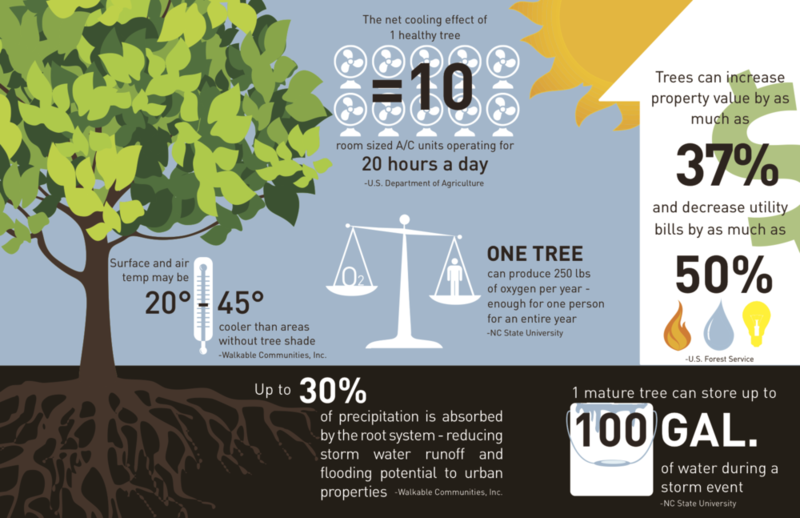 During a 1 inch rain event, a fully-grown street tree can hold up to 100 gallons of water in its canopy alone. Tree canopies also reduce soil erosion by offsetting water that would otherwise hit the soil, lessening the impact of rain on the ground surface. Along with water, trees take up trace amounts of harmful chemicals from the soil. Inside the tree, these chemicals may be transformed into less harmful substances, used as nutrients and/or stored in roots, stems, and leaves. WE EXPECT THIS CANOPY ENHANCEMENT WILL CAPTURE OVER 544,440 GALLONS OF RAINWATER ANNUALLY. This aspect of the program focuses on the need for both rain barrels and rain barrel education in our neighborhood. According to a drive-by assessment of our neighborhood, we have determined that less than 5% of houses have rain barrel attachments. This plan will bring 100 rain barrels into our neighborhood at no cost to the community, while educating residents on the value of rain barrels, as well as how to install, maintain, and best use them. During a 1 inch rain event, over 700 gallons of rainwater can fall from a home’s roof structure. Much of this water floods into the street, and eventually into the city’s stormwater sewer. By using 1-2 rain barrels, homeowners can store enough water to water their garden (depending on size) for up to a week, while reducing the load on the city’s infrastructure. During summer months, a single 55 gallon rain barrel can save over 1,300 gallons of water to be used for gardening, yard watering, and more. EXTRAPOLATING FROM THE EPA'S 1,300 GAL./SUMMER ESTIMATE FOR RAINWATER COLLECTION, THESE 100 RAIN BARRELS WILL SAVE OVER 473,800 GALLONS OF WATER FROM GOING INTO THE CITY'S STORMWATER SEWERS ANNUALLY. Street litter is a public health hazard, especially during rain events. This street litter washes into the city’s stormwater systems during large rain events, eventually taking it into waterways. This results in negative impacts on wildlife in and around streams and rivers. In many cases, litter waste in waterways can reduce oxygen levels, suffocating marine plants and animals. Much of this litter doesn't break down, washing up on the shores of these waterways, posing additional risk. In addition to creating hazardous conditions, this puts additional strain on the government by requiring repairs to stormwater infrastructure. This part of the program focuses on reducing the amount of trash that enters the city’s stormwater infrastructure system. In the most recent “Trash Bash” neighborhood cleanup event (cohosted by Bluegrass Greensource, NoLi CDC, Downtown Lexington Corporation, etc. ), the North Limestone neighborhood had the most street litter of all of the neighborhoods cleaned. The anti-litter campaign and street cleanup will help reduce the amount of street litter that ends up in the Lexington’s stormwater system. This aspect of the program involves planting edible fruit trees in a yet-to-be-determined location. This will create a free fruit orchard for the residents of the North Limestone Neighborhood, one of Lexington’s largest food deserts. It will also provide the same water quality benefits as the broader tree planting component of the program. THE EDIBLE ORCHARD WILL CAPTURE OVER APPROX. 90,470 GALLONS OF RAINWATER ANNUALLY. Want a tree or rain barrel? Sign up with your email address and we'll let you know when we can get a tree to you. Remember, you have to live in the Castlewood, MLK, or North Lime Neighborhood.